With the annual increase of rhino poaching not only in South Africa but in the Eastern Cape Province, the need arose to complement the Shamwari Game Reserve Rhino Protection Unit with K9 tracking capacity. 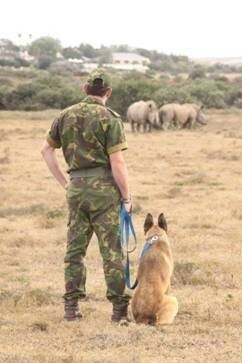 The Chipembere Rhino Foundation (CRF) has facilitated and sponsored a dog as they successfully supplied trained dogs for rhino protection elsewhere in the Eastern Cape during 2014 and 2015. 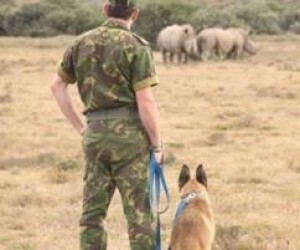 The Chipembere Rhino Foundation identified a young Belgian Shepherd at a well-known Port Elizabeth based Dog School, which would fit all the requirements for anti-poaching tracking. The dog, Blade, 18 months old, was trained off site before it was introduced and trained by its handler, Cabous Pretorius, at Shamwari Game Reserve since the beginning of April. Blade had to adapt to a Big Five environment which he has done perfectly. “Blade will be a valuable asset in the fight against rhino poaching and will primarily be utilised to locate and apprehend rhino poachers. We sincerely thank the Chipembere Rhino Foundation for arranging Blade to come and work at Shamwari Game Reserve," says Shamwari Group General Manager, Joe Cloete. Blade will be officially introduced as a working dog after completion of his final exams at the end of May.